CardMonkey's Paper Jungle: Christmas Countdown: 100 Days 'til the Big Guy! Sentiment cut from Cricut's "Joys of the Season" cartridge. 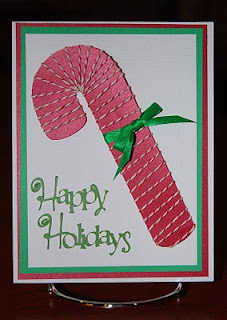 Candy cane cut from Users' gallery in "Make the Cut". Candy cane wrapped in red/white baker's twine. Green ribbon bow from stash. Triple mounted on red, green, white cardstock. In case you (like me) almost missed the date, I'd just like to point out for the planners among you (not me!) that today marks the start of the 100-day countdown until Christmas!! Egads, where does the time go? I hope it won't be too intrusive, but I'm planning (eeek, there's that word again!!) to post a picture of a Christmas card I've made for mailing this 2011 season. I'll endeavor to list the recipe for the card in the photo caption. From time to time, the card will simply pop up randomly in a non-Christmas posting. This means that not only do we have other occasions to celebrate throughout the year, we all should endeavor to keep Christmas in our hearts all year long. Here is my 100th day card, an oldie but a goodie. Yes, I admit that I pulled this from my stash of cards I made last year. Because, no, I haven't even begun to think about Christmas!!!! Oh my goodness, I feel sick! I can't believe it's so close.... Cute card, neat idea with the twine! I've giving thought to my Christmas cards but, I haven't started to make any of them yet.... not with the move once I get situated I will.